On the banks of the picturesque river Hovtva, in the Poltava region, there is the town of Reshetylivka - one of the most famous modern centers of folk crafts of Ukraine, which came into bloom in the XIX century. 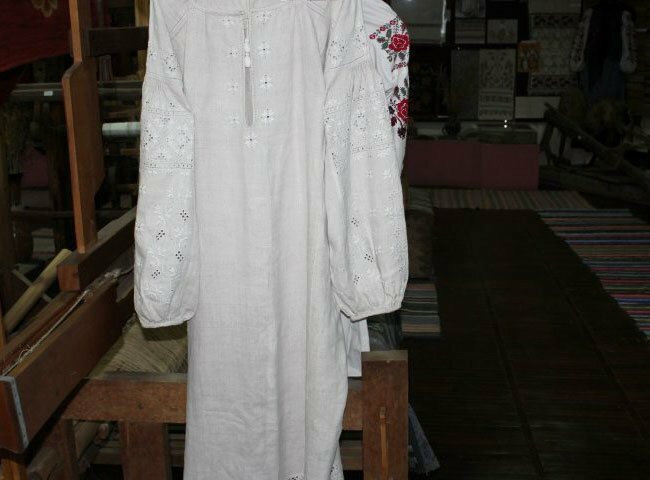 There the tradition to embroider with white threads on white fabric, known as the technology of embroidery "white on white", or "bil", was born. Scholars believe that the name of the Reshetylivka comes from the saying "to make holes in the cloth". This process means masking the joints when joining two parts of cloth holes made in fabric (drawn-thread work). Bil embroidery has existed for as long since fabric and plain weave exist. 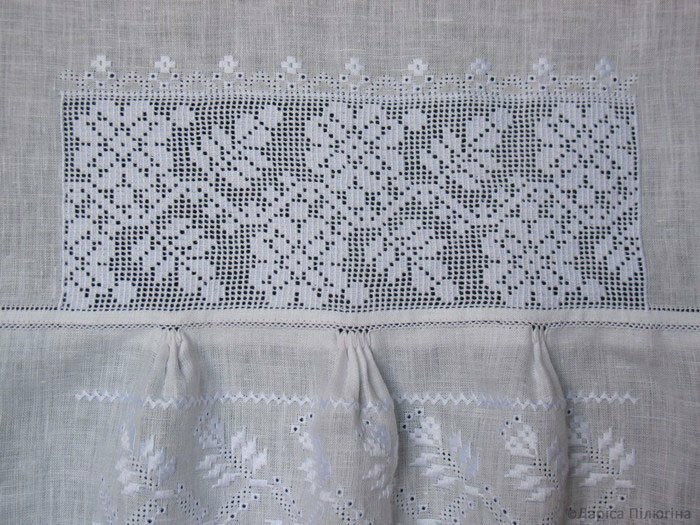 One of the earliest examples of the ornament with white hemstitch, in combination with making holes and drawn-thread work can be seen in Chernihiv towel dated 1746. Today this towel is stored in the Chernihiv History Museum. Over time, this original embroidery has spread in all ethnographic regions of Ukraine and become a hallmark of Poltava and a brand for Ukrainian culture. Fragment of a woman blouse by craftswoman Larysa Piliugina. Traditionally, “bil” was used to embroider towels, as well as festive, wedding men's and women's shirts. Today they still are made of thin transparent fabrics-linen, voile, batiste, silk. The peculiarity of Reshetylivka embroidery is a combination of floral and geometric patterns – "periwinkle", "hop", "moroka", "kuriachyi brid", "zozulka", the most favorite – "branch" and "broken wood". The geometric ornament consists of the simplest figures: oblique and straight cross, square, rhombus, triangle and star motifs. A special feature is the simultaneous combination of five to seven techniques: "lyshva" different types "hemstitch", "cut", "puncturing", "nightingale eyes” and "grain output". For contrast, craftsmen add unbleached yarns or yarns dyed in ash colors. This embroidery creates a high relief pattern with black and white modeling. Depending on the direction of the light, the pattern differently reflects and absorbs the light, creating its rich play. At the end of the XIX century Reshetylivka officially became one of the centers of folk weaving, carpet weaving and embroidery in Ukraine. In 1905, the Governor and Council there founded the cooperative for embroidery and tapestry – Reshetylivka weaving training and demonstration center, on basis of which in 1922 the art and industrial cooperative "Troianda" (Eng - rose flower) and embroidery shop were formed. Starting from 1926 – a cooperative named after Klara Tsetkin functioned there. 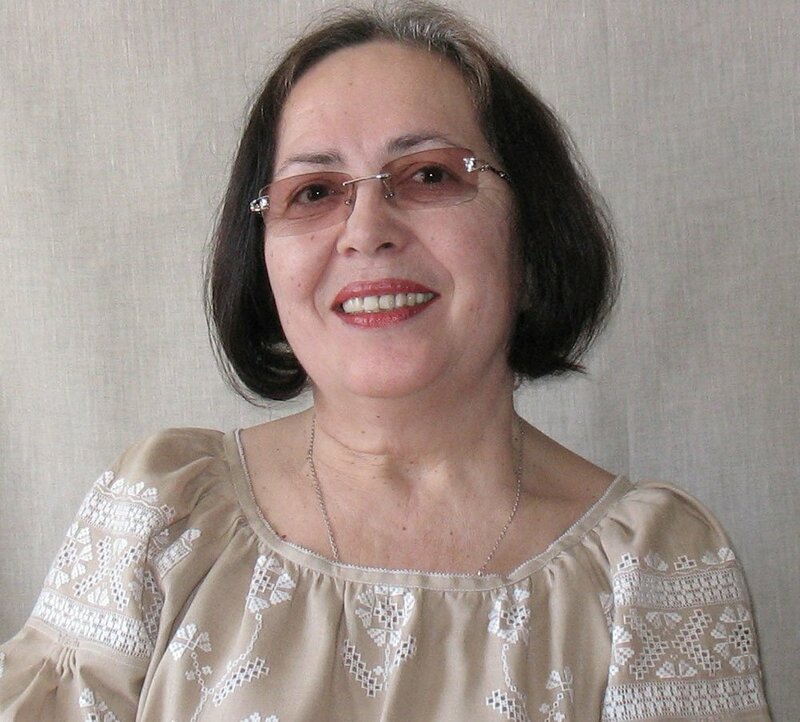 One of the oldest Reshetylivka embroiderers, Frosyna Rebryk, is known for the fact that in the 1930-1940-ies she handed over a Reshetylivka towel to Maksym Horkyi, Joseph Stalin and Mykyta Khrushchev. Since 1960, the factory of art products with its own school of craftsmen operated. Today the carriers of the embroidery white on white technology are craftsmen and teachers of Reshetylivka artistic professional school, embroiderers of the private workshop "Solomiia", teachers of Reshetylivka children's school of arts and I. Oliinyk Gymnasium of Reshetylivka. The city has about ten private workshops. 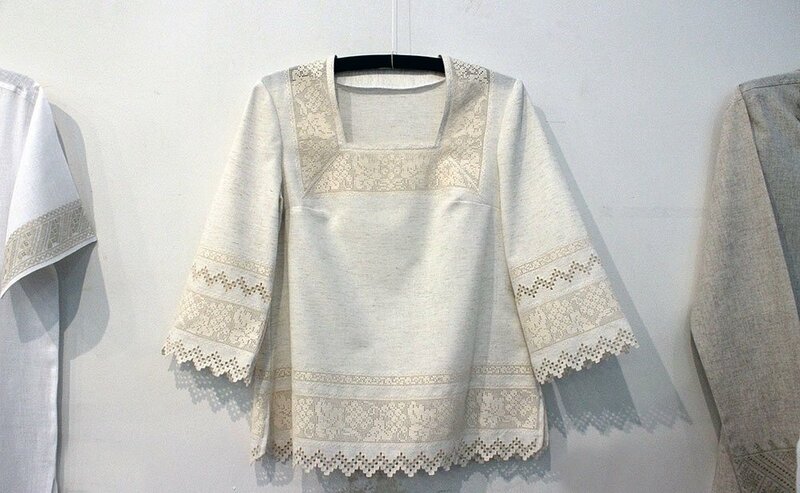 Modern embroiderers, Nadiia Vakulenko, Larysa Piliuhina and Nina Ipatii, state that it is very difficult to embroider with white threads on white cloth, especially for the eyes, because the ornament is never applied to the fabric immediately. First, the craftsman draws the "picture" on paper, and then, by a complex calculation, transfers the picture to the canvas. Such hard work takes from two to six months to complete one garment. Back in the 1920s, the town gained world fame at the exhibitions of Ukrainian art in Munich, Paris, Marseille and Brussels. 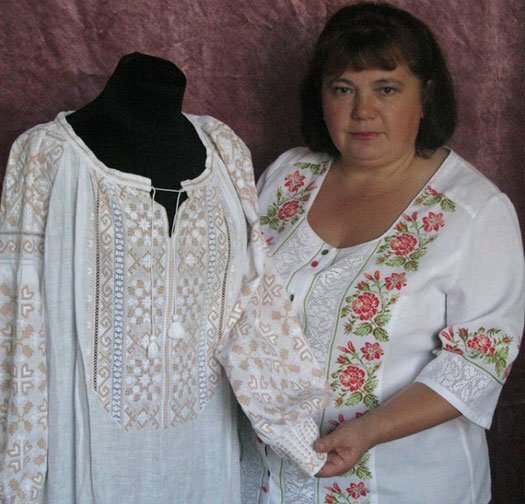 It is interesting that once a writer and ethnographer Olena Pchilka had to present at the competition in Paris the embroidery in "bil" technique completed by the carftsmen of Reshetylivka factory. When people did not believe that it was the work of human hands, O. Pchilka brought the carftsmen, that simply amazed the jury. Reshetylivka craftsmen in 1969 produced a dress in the "white on white" technique for the world famous Italian actress Sophia Loren for the film "Sunflowers" (1970). This movie shooting location was chosen to be the village of Chernechyi Yar near Dykanka in Poltava region. Then the actress demonstrated this dress on the podium in Rome. Now a copy of Sophia Loren`s shirt is kept in Reshetylivka Museum. Nevertheless, beside the glory of Reshetylivka, there is an acute problem of the young craftsmen. 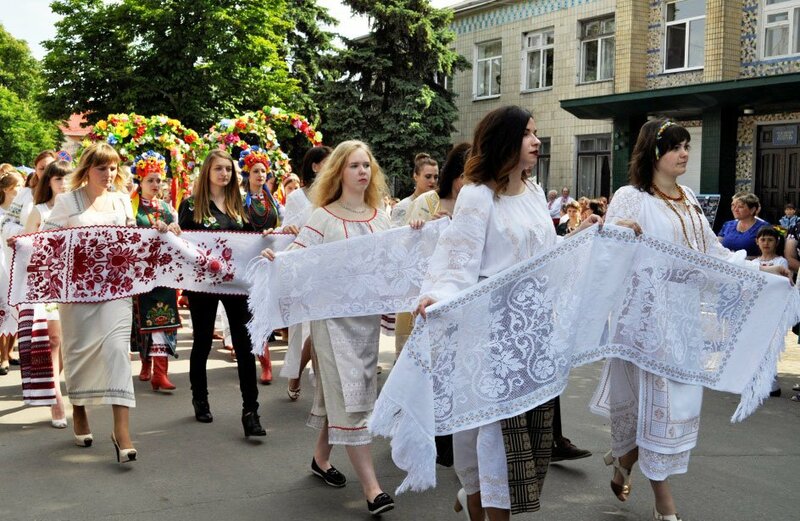 Therefore, in February 2018, the technology of embroidery "white on white" of the Reshetylivka village of Reshetylivka district of Poltava region was included in the national list of elements of intangible cultural heritage of Ukraine, which stipulates an implementation of measures for its protection by Reshetylivka Art Professional Lyceum. Kara-Vasylieva T. V. Poltava folk embroidery. 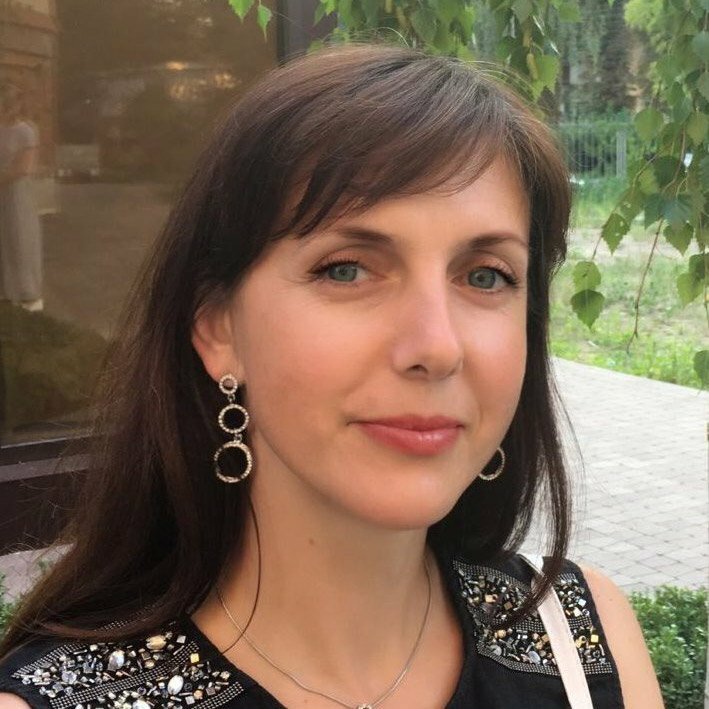 Kyiv: Naukova Dumka. 1983. 135 p.
Tytarenko V. P. Poltava folk embroidery: past and present (educational aspect): studies.-methodical textbook. Poltava: Layout, 2000. 136 p. 21. Ukrainian folk art. Fabric and embroidery. K., 1960. 62 p.
This webpage uses the materials of the Reshetylivka Museum of Local Lore, the websites http://reshetylivka.com.ua/, http://gobelen.in.ua/ and the photographs by embroiderers Larysa Piliugina, Nina Ipatii and Nadiia Vakulenko.